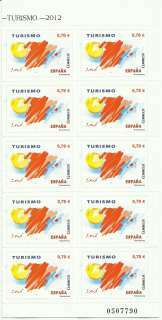 A new postage stamp dedicated to Tourism has been put in circulation, showing the importance this sector has for people in general and for the economic and social development of countries. The desire to learn about other places, territories and regions, discover new cultures and ways of life and relax and enjoy holiday periods in order to break with everyday routine are just some of the reasons that have given rise to the generalised practice of tourism. In Roman times, summer resorts and residences were converted into places where the upper and privileged classes with sufficient resources could relax and enjoy themselves. Since then, the concept of tourism has changed considerable and it is now a social and expansive practice open to everyone. The tourism phenomenon first arose during the mid-nineteenth century with the arrival of the railway, and for the first time, travel itineraries were organised in different parts of the world. At the end of the nineteenth century, the promotion of visits to spas also commenced, and bolder travellers were brave enough to travel to more remote and perilous parts of Africa and Asia. One century later, the organising of charter flights gave a decisive boost to the expansion and internationalisation of mass tourism, with the decade of the 1960s being marked by the mobilisation of large flows of tourists which have grown incessantly since then. Today, tourism has become an economic activity that plays an important part in the trade balance of countries and in the creation of countless jobs related to and stemming from the activities carried out in this sector. The development of traditional arts and crafts, the preservation of artistic and natural resources, the conservation of the local gastronomy of different countries and regions and the maintaining of traditions considered to be of interest have enabled the tourist sector to offer a wide range of possibilities to suit all tastes. 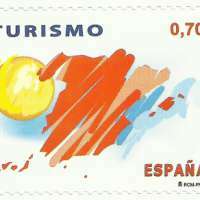 The seal, with a face value of 0.70 euros, expresses the concept of tourism in the form of a bright sun shining down on the peninsular and insular regions of Spain and the blue waters that bathe its coastline.